"(Turner's) playing is incandescent, his tunes seething with life's moods and drives. They don't always follow a strict melody line, but seem to search around for interesting moments, stopping here and there to nail the moods in a passionate embrace with his superb technical command, and then move on again and again. This disc is a great listen." 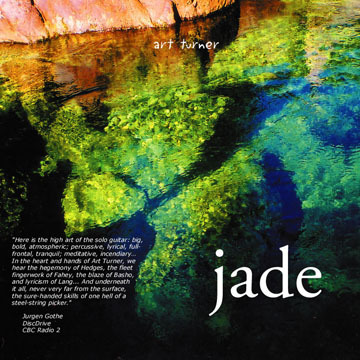 "Jade" is a deeply satisfying journey into the resonant, sonorous depths of solo steel-string acoustic guitar. With seven originals and four covers, it features audience favourites like Si Bhig, Si Mhor, The Lone Ranger & Tonto Fistfight in Heaven, Redtail Circles the Sun, and Good Hands. While this album showcases a fair amount of innovative fingerstyle guitar technique (Turner makes use of an impressive array of harmonic tapping, scratching, slapping, and neck-bending techniques) it never gets in the way of the emotive, transportive quality of the music. As Six Strings 2 producer Bill Garrett puts it, "There's no question that Art paints an aural landscape that lets the listener go far beyond their living room loudspeakers and on to other places. He is a formidable artist with a wide palette."